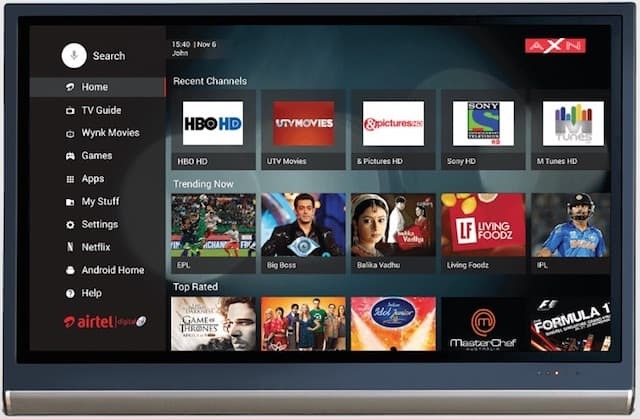 Airtel has announced India's first 'hybrid set top box (STB)' called the Airtel Internet TV. The hybrid set top box basically is your regular set top box with an added functionality of streaming content from the Internet. A no-brainer guess is that you'll require a solid Internet connection in order to stream stuff from the Internet on your TV. Airtel officially recommends 4 Mbps connection; and promises a set of 500 satellite TV channels along with all of the Internet media on your TV. All that, for a subscription fee of Rs. 4,999 for 3 months or Rs. 7,999 for full year. These charges don't include your Internet data charges. Until now, if you wanted to view your favorite YouTube web series or videos on TV, you essentially required a smart-tv with Wi-Fi or just hook it up to your laptop. Airtel Internet TV solves that problem - by offering you a single box that does everything. That is, you can view your regular TV channels and also switch to Internet content using the remote of the set top box. Airtel has specially partnered with NetFlix to make their content available. However, the Netflix subscription is NOT included in the subscription plan. Users will have to purchase NetFlix plan separately. One good inclusion is in-built Chromecast. The feature will let you quickly pair your smartphone or tablet with the Airtel STB and stream content on it to your TV. That means watching photos, that you just clicked with your phone, directly on TV will mostly be painless. The Airtel Internet TV is Android powered, which brings all the compatible games from Google Play Store directly to your TV. You will be able to use your smartphone as a controller by downloading the Gamepad app. The remote bundled with the STB has voice search feature which will relieve you off typing on on-screen keyboard. Other notable features include 4K support, DOLBY ATMOS sound, on-board storage so that you can pause any live show and record it, expandable memory using SD card, bluetooth support to connect your remote, keyboards and game controllers etc. Existing Airtel Broadband subscribers can get up to 25GB of additional data every month free of cost. Head over to Airtel Internet TV with one year full SD & HD channels: Amazon.in: Electronics to buy the box. The launch of Airtel's Internet TV comes at the right time. Reliance Jio is readying their own Internet STB and is all set to disrupt the DTH market in India. Airtel wants to be the early mover and keep its game up. Airtel's plan doesn't look very economical to us because apart from converting your existing dumb TV into smart TV there's not much on the table. If you already have a smart TV, you've already been doing everything that Airtel STB offers for a price. Do share your opinion with us through comments below. Price is right placed, with all HD channel with Internt TV. Right on the spot. Users are saying they are able play local phone content via chromecast. After my subscription ends, will I able to use internet content via mirror/chromecast? Here is official response from Airtel. Amazon.in: Questions And Answers: will it work with my wifi when my 3 months subscription ends?? Charges are too much to ask. Initial impression with 1st year subscription is fine. But it seems they just want to retain users from jumping to internet only or JIO services.